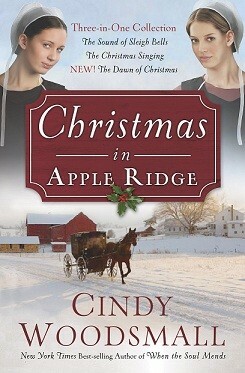 Book Review - "Christmas in Apple Ridge"
Cindy Woodsmall has a collection of Amish Christmas novellas just in time to get us all in the spirit of Christmas! "Christmas in Apple Ridge" contains three novellas, two of which have been previously released in past years, "The Sound of Sleigh Bells" and "The Christmas Singing," and the third novella, "The Dawn of Christmas," is brand-new! I reread the first two novellas, enjoyed them and fell in love with the characters all over again and loved the new story just as much! Each of the three main characters in the novellas, Beth, Mattie and Sadie, have all experienced heartache and are hesitant to fall in love, yet love seems to find them during the magical Christmas season. Each story is centered in Apple Ridge, a community that sounds so lovely and a place you would want to visit or even be a part of! These three women are all very independant and strong women, yet are so tightly knit with their families and yet at times find their families to be involved and meddling too much. This is where the stories get so interesting as plans backfire and really lead to surprises for the characters. Even if you have read the first two stories, this is a collection you do not want to pass on! As soon as you start reading the first page, you will drawn back into the characters' lives and want to keep reading until the very last page and even then you will not want to leave Apple Ridge! Book Review - "A Farmer's Daughter: Recipes from a Mennonite Kitchen"
Dawn Stoltzfus shares her heritage through stories, and recipes in her book, "A Farmer's Daughter: Recipes from a Mennonite Kitchen." I love the wide variety of recipes included in this book! A great variety of types of dishes, various ingredients and cooking style, including some slow cooker recipes. I love the history and stories behind recipes and recipes being passed among generations, I think that is what is so appealing about this book to me! This is a great cookbook filled with good, wholesome recipes and stories! Place the first four ingredients in a bowl and beat well. Pour into an 8x8 pan. Cover; freeze for 3-4 hours. Let soften slightly before scooping. Serve in small bowls; garnish with gingersnaps, whipped cream, and cinnamon, if desired. Serves 6-8. 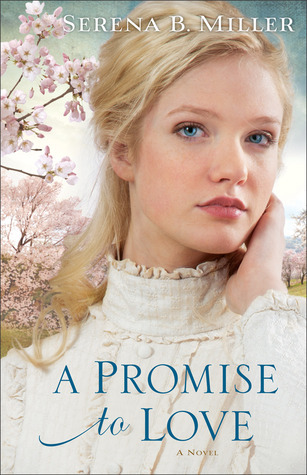 Book Review - "A Promise to Love"
I enjoyed Serena B. Miller's novel, "The Measure of Katie Calloway," and I was excited to hear she had a new novel out; I was not diappointed at all! "A Promise to Love," is written in the same style and I was immediately drawn into the story and the characters' lives. I love that some of the characters from Miller's first novel played minor roles in this one as well! Ingrid has come to America with the hopes of finding her brother Hans who is working in a lumber camp. However, she has not had any luck yet and instead finds herself proposing to a man she has only met once as a means to keep his children with him. Ingrid throws herself into the role of being a mother and finds herself caring deeply for and even loving her new husband Joshua. However, Joshua is still in love with his first wife whom has passed away. Just when it seems as if their marriage may becoming something more than a marriage of convenience, something or someone interferes. In the midst of a drought, Joshua goes to work in a lumber camp and finds out where his wife's brother is; however while they are both away, fire consumes the town and the entire family is faced with difficult choices to make. I loved this story! It is a story of heartbreak, love, and survival. Diantha's mental health struggles are so real and yet not addressed often; however it is handled well in this book as her death was such a mystery to everyone as well as her behaviors and day to day living. The minor characters all played such important roles and I am hoping that the next book will involve some of the characters again, not only Robert, Katie and Delia, but also Hans, Hazel, Susan and Lyman. This is a wonderful historical romance that should be on the top of your must-read list! 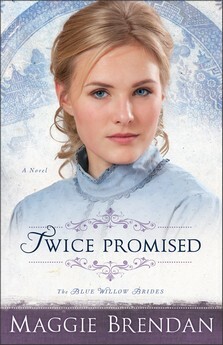 Book Review - "Twice Promised"
"Twice Promised," Maggie Brendan's second book in The Blue Widow Brides series, is a the story of the middle Olsen girl and it is every bit as good as the first book in the series if not better! Greta had falled in love with Bryan, however he is killed in battle before he is able to return home and marry her. Greta responds to a mail-order bride ad and sets off to meet her groom. However, Greta is in for a surprise when she meets another young lady who has also been writing to this man and she is prepared to marry him as well. This is not all of the surprise though, Jess has no idea that both girls are there to marry him as his brother Zach placed the ad and has been corresponding with both Greta and Cora. The brothers each choose a "bride" based upon an idea that Granny comes up with; however have they chosen the right girl for themselves and with Cora and Greta stick this out or return to their homes? This is such a great book! I read this in two sittings, I did not want to put it down! It is entertaining, heart breaking, and filled with romance! The characters are great and the minor characters add so much to the story as well. Granny, Caleb, Martha, Agnes and Cole all play important roles in the story, but also help the reader to learn so much more about the main characters and who they really are and their values. Greta's sisters are mentioned and play very minor roles as well, but I was glad they were mentioned as I wanted to know how their lives were going as well. I am looking forward to the third book, Anna's story, and am hoping to hear more about Caleb as well. This is a book that you do not want to miss if you enjoy historical fiction! Book Review - "The Marriage of Your Dreams"
"The Marriage of Your Dreams: A woman's guide to understanding her man," written by Rick Johnson, is filled with scripture, stories, questions and answers to help couples improve their marriage relationship. Each chapter addresses a specific area of a man, for example, his emotions, his relationship with his mother, his work, his need for respect and his sexuality. Each chapter is written with the goal of explaining this area more fully and helping a man's wife understand this part of him better. This is a great book for someone to read if she has been married for months or years or is engaged to be married. While reading this you will gain a new perspective and think about your husband in a different light. Johnson's style of writing is very easy to read and follow and this is a relatively quick read. Also, if there is something specific in your relationship that you believe needs working on, the book is split into well-defined chapters and you can easily find the section you would like to read about. 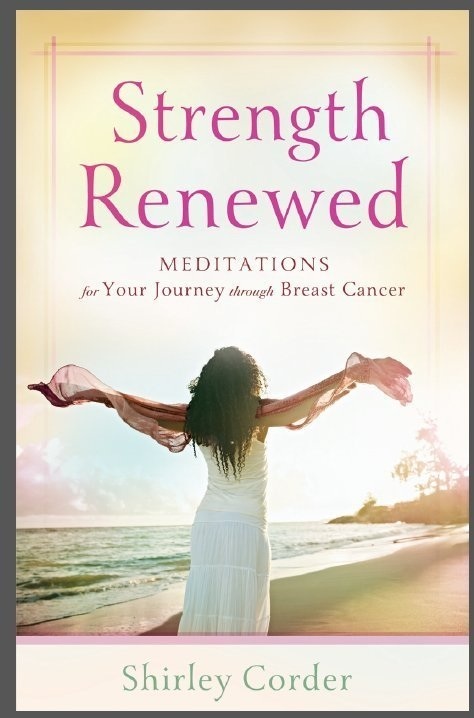 Book Review - "Strength Renewed"
Shirley Corder shares meditations, devotionals and her thoughts in her book "Strength Renewed: meditations for your journey through breast cancer." Corder is a breast cancer survivor and her own personal journey is shared to help others cope through this difficult time along with Biblical passages meant to give hope. The book contains 90 meditations, each one being only about two pages. These are short tidbits that are meant to be uplighting and offer encouragement and hope yet also to help one not feel like she is not alone with this battle. This book is an excellent one to share with someone who has been diagnosed with breast cancer and it can be a way to offer your support and show your care at a time when it is difficult to know what to say and do. Thank you Shirley for taking the time to write this book and help others. Book Review - "A Love Surrendered"
Julie Lessman's Winds of Change series continues with book 3, "A Love Surrendered." Annie has moved to Boston and is living with her Aunt as she is an orphan; however she is trying to prove that she is not a little girl anymore and is a woman. This leads to her becoming involved with a fast crowd, including Steven O'Connor, her sister's former boyfriend. Steven is trying to stay on track and he is known for being straight-laced, and his friends question how he was ever with Maggie. Annie is determined to fit in with this crowd of people who were her sister's friends while she lived in Boston, however Annie is guarding the secret of who she really is and who her sister is. This is an excellent story that continues on with the O'Connor family. The O'Conner family has come alive in Lessman's books and they all deal with issues in their lives and relationships that readers can relate to and empathize with. This is a book filled with twists and turns, romance, and emotional scenes that will have you turning the pages and engrossed in the family and the drama throughout the book. Book Review - "You Don't Know Me"
Enter today by clicking one of the icons below. But hurry, the giveaway ends on October 22nd. Winner will be announced at the “You Don’t Know Me” Author Chat Facebook Party on 10/23. Connect with Susan for an evening of book chat, Deep Haven trivia, and a live video chat! There will also be a chance to win gift certificates, books, and other fun prizes! Don’t miss a moment of the fun, RSVP today. Tell your friends via FACEBOOK or TWITTER and increase your chances of winning. Hope to see you on the 23rd! Find out more about Susan May at http://www.susanmaywarren.com/. I have read all of Susan May Warren's Deep Haven novels and have liked them all; however her latest, "You Don't Know Me," is the best one in my opinion! Annalise is the model wife and mother, her husband is running for town mayor, she takes care of the home, attends all of the events that her children participate in and has a great relationship with her mother-in-law whom lives across the street. However, Annalise that a huge secret that no one knows about and she tries not to think about too much, that is until Frank arrives in town. Years earlier, Frank became Annalise's agent when she was forced to take on a new identity and recolate through the Witness Security Program. Now that Annalise's life as well as each of her family member's lives may be in danger, Annalise has difficult decisions to make while maintaining the facade that she has been living behind as well for so many years. This book is one that kept me turning the pages and I did not want to stop reading until I reached the end. The characters are so real and their struggles and every day life and their relationships are what readers can reate to and empathize with. Annalise and Nathan are raising three children and living across the street from Nathan's mother. They are an "All-American Family;" yet they each have their own struggles as well. Nathan and Helen have had to live and deal with the broken marriage and death of Nathan's father. Helen may have the chance for love again; however the cancer may have returned as well. Each of the children have struggles in their own lives; either finding out who they really are, relationship and first love struggles, and pressure of fitting in with peers. This is a story that should not be missed out on, it is a portrayal of small town life, a "perfect" family and the support that is needed and provided for neighbors. Book Review - "Return to Sunday Dinner"
Sunday Dinner has always been an important part of my life, from when I was a young child and having Sunday Dinner at my grandmother's house to now having dinner at my parents' house still almost every Sunday. Therefore, I was excited to get a chance to review Russell Cronkhite's "Return To Sunday Dinner." Sunday Dinner is so much more than just sitting down and eating, it is a time to spend with loved ones, enjoy talking and time spent together and enjoying a meal; all this together is what creates this weekly event of Sunday Dinner. Cronkhite has created 24 meals that he shares the recipes for in this book, some are more "fancier" than others, but all have the potential to be that Sunday Dinner that family will gather around a table eating together, making memories. Also, Cronkhite shared thoughts and comments about each menu, thus helping to guide you toward the meal you want to serve for a certain type of Sunday Dinner setting. There are also tips shared for prep work and time savers to help the cooking and serving go more smoothly and will not wasting precious time. There is a wide variety of recipes included in this cookbook and the pictures are very nice as well. This is a book that you will not to miss out on as it will have you thinking back to Sunday Dinners and have you thinking ahead to Sunday Dinners yet to come! Book Review - "When A Heart Stops"
Lynette Eason's Deadly Reunions series continues with book 2, "When A Heart Stops," and once you start reading this book you are not going to be able to put it down! Serena works as a Medical Examiner and she is used to dead bodies and having to study them; however suddenly the bodies she is working with and the individuals deaths are becoming way too personal for her as they are people she graduated from high school with. While the deaths are similar to a serial killer's actions years ago, the killer is still locked up; will they make connections soon enough? Also, Serena has someone following her and breaking into her home and only she knows why. Serena, Alexia and Jillian were best friends in high school and there ten year high school reunion is quickly approaching and Jillian is planning to return for this after suddenly disappearing on graduation night. However, prior to her arrival she has sent a package to Serena with instructions not to open it until she hears she has been killed. For some reason, someone wants this package and Serena is not willing to give in to her fears, even when her life is on the line. This book is so well-written, it moves at a fast pace and the characters are so real. Serena and Alexia have no idea why Jillian vanished ten years ago, but they know that she was afraid, and they would both like to know the cause of her disapperance and also to see her again. Alexia and Dominic have been patching up their relationship and are searching for their father as well as trying to come to terms with their mother having a serious boyfriend. Serena is living her own life and immersed in her work and is determined to not have a relationship with a man whom has characteristics of her father's, such as controlling and so involved in his work that that comes first. Serena had a crusch on Dominic while growing up, and while there are similarities to her father, he may just be the one for Serena. I cannot wait for the next book to come out as it is time for Jillian's arrival back in town, the secrets of the package and her disapperance to be revealed and the connection of all of this with the upcoming election. A high suspense romance that you do not want to miss out on! 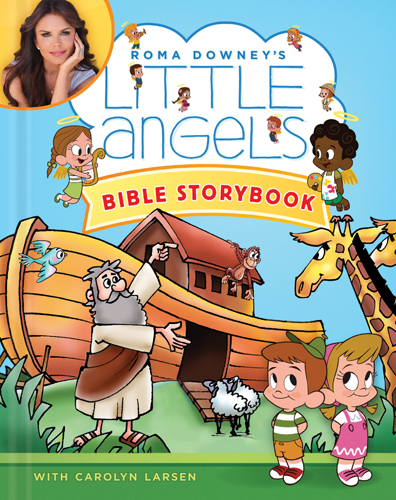 Book Review - "Roma Downey's Little Angels Bible Storybook"
I was thrilled to have a chance to review Roma Downey's "Little Angels Bible Storybook!" Filled with 100 Bible stories, it a perfect way to introduce Biblical characters and stories to young children as each story is concise and is written in about three pages and includes vibrant and adorable illustrations. Along with each story there is also a short prayer included, a verse to memorize, an activity suggested to reinforce a lesson taught in the story and a sentence that summarizes the lesson taught in the story. This is a sturdy edition that is perfect for young children. My two year-old son has spent a lot of time paging through the book looking at the illustrations and pointing out various things on the pages. Both he and my four year-old daughter have enjoyed listening to the stories. The stories are a perfect length to hold their attention and the illustrations are very well-done, filled with detail and bright to catch their attention. I highly recommend this Bible for young children! Book Review - "To Love and Cherish"
"To Love and Cherish," book 2 in Tracie Peterson and Judith Miller's Bridal Veil Island series is a lovely story that will keep you turning the pages until the end. Melinda has been waiting for Evan to propose to her, but when he has not she has to return home with her family. After a hurricane strikes, Melinda returns to check on Evan as she has no idea if he is alive and well or dead. Melinda finds Evan well and she accepts a job on the island; however just being on the same island does not mean that their relationship is all happy and smooth. The hurricane is not the only thing that is disrupting life in this story! I loved the historical details that are included in this story. It really made the time period of the late 1800's come alive and added quite a bit to the story. There is a lot that goes on in this story, this is not "just a romance story" as it is has so much including betrayal and suspense. While this is a part of a series, it is not essential that book 1 be read first; however it is a great book that you do not want to miss out on! Book Review - "Life With Lily"
Suzanne Woods Fisher’s brand new series for young readers, The Adventures of Lily Lapp, is here! Co-written with the widely popular, ex-Amish blogger, Mary Ann Kinsinger (A Joyful Chaos), Life with Lily is already beloved by readers of all ages. To celebrate the release Suzanne and Mary Ann will be giving away TWO eReaders (either the new Kindle Fire or the new Nook HD – winner’s choice!) and will be hosting an Author Chat Party on Facebook! Enter today by clicking one of the icons below. But hurry, the giveaway ends on October 15th. Winner will be announced at the Life with Lily Author Chat Facebook Party on 10/18. Connect with authors Suzanne Woods Fisher and Mary Ann Kinsinger for an evening of book chat, Q&A about Mary Ann’s Amish childhood, trivia, and fun! There will also be gift certificates, books, and other fun prizes! Don’t miss a moment of the fun, RSVP today. Tell your friends via FACEBOOK or TWITTER and increase your chances of winning. Hope to see you on the 16th! Lily is six in this story, just starting first grade in a one-room schoolhouse in upstate New York. Her parents are busy building a farm, and soon animals join the family—Jenny the cow and Chubby the miniature horse. A baby brother arrives, too, which Lily has mixed feelings about. (She wanted a sister!) Aside from a mischievous friend like Mandy Mast, Lily is happy at school and even happier at home. Trouble is brewing at the schoolhouse and change is on the horizon for Lily and her family. Be sure to visit the “Adventures of Lily Lapp” interactive website. The site is fun for all ages and loaded with games, downloadable coloring pages, Mama’s recipes, a way to ask Lily questions, book giveaways …and more! Check it out by clicking on the site logo. I am a huge fan of Suzanne Woods Fisher, so I was excited to read book 1 in her new series, a series for children! I have read this book myself and I am also reading it to my daughter, she is four and she enjoys it as well! It is a long book for young children, so we have been reading through a chapter a day. The style of writing is perfect for children as it is written from Lily's point of view and her thoughts and questions reflect those of young childen. The descriptive writing is perfect as well for young children. I think my daughter's favorite scene so far is when Lily's grandmother is decorating Lily's mother's birthday cake with pink frosting that tastes just like pink frosting should taste. While reading this book be prepared for giggles, questions and overall a good book to experience and share together!